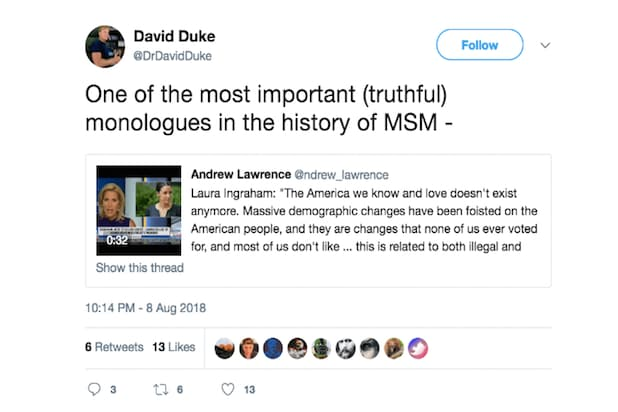 “One of the most important (truthful) monologues in the history of [mainstream media],” he said in a quote tweet along with a link to a video of the segment from Ingraham’s Fox News show. He later deleted his remarks, though a screen shot of the moment was captured by the Daily Beast, which first reported the story. It’s unclear why Duke deleted the message. He did not respond to request for comment from TheWrap. A rep for Fox News did not immediately respond to request for comment. 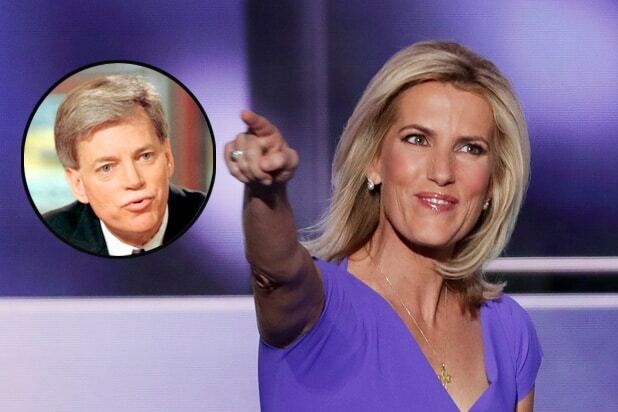 On Wednesday, Ingraham raised a storm of outrage for her monologue, which a broad spectrum of critics online criticized as racist in tone. Duke, a former Louisiana state representative and two-time presidential candidate, has long been one of the most polarizing figures in American politics. He was present as the deadly white supremacist rallies in Charlottesville, Va., last year and also offered effusive praise to President Donald Trump, who as a candidate struggled to condemn him back in 2016. Duke also appears as a character in Spike Lee’s new fact-based movie “BlacKkKlansman,” portrayed by Topher Grace. The movie follows a real-life case from the 1970s when an African American undercover detective infiltrated the Klan and duped both its members and the visiting Grand Wizard himself.